Registration for the 2018 Best Firms To Work For Award is now open! 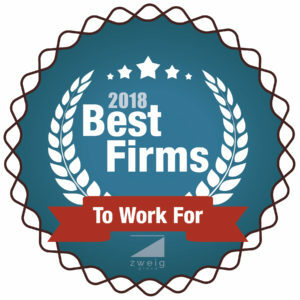 The Best Firms to Work For award recognizes the top architecture, structural engineering, civil engineering, environmental, geotechnical engineering, landscape architecture/planning, and multi-discipline firms in the US and Canada based on their workplace practices, employee benefits, employee retention rates, and much more. Participating in the award process is an effective and efficient way to gain employee insight. All participating firms receive a summary report of their employees’ survey responses and a report containing valuable benchmarking data from all firms in a given category. Firms will be ranked according to their category based on a combination score comprised of 25% corporate survey and 75% employee surveys. The first step in your ranking is the BFTWF Corporate Survey. This is a survey about workplace practices, policies, & benefits, and can be filled out by any firm leader, HR manager, or equivalent representative. The second step in the application is the Employee Survey. This survey will be available in late January 2018. Employee survey options: Employee survey can be sent by Zweig Group, directly to your employees (new this year! ), or a firm representative is welcome to distribute the participation link internally. For firms with 50 employees or more, a minimum of 40% of the firm’s staff must complete the Employee survey. For firms with less than 50 employees, a minimum of 60% of the firm’s staff must complete the employee survey. Someone from Zweig Group will keep you updated on your firm’s participation level to ensure that you meet the requirements by the deadline. Standard with your application fee is a report containing summary responses to all the numerical rating and multiple choice questions from the employee survey. Open response reports are available for only $250. You can also choose to have your employee survey reports broken down by specific offices if you have multiple offices. There must be at least 10 completed surveys from each office for this option. Office Reports are available for only $100 per office. Did you know Zweig Group also offers custom survey add-ons? For $400 you can add on 5 custom questions to the end of your employee survey. For $600 you can add ten questions. This is a great way to get the most out of the employee survey portion of this award application process. The Deadline to enter and complete all necessary surveys is May 1st, 2018.